President Trump's deregulatory boss is now seated on one of the most powerful courts in the nation, where she'll have lifetime tenure to influence environmental policy and other issues. 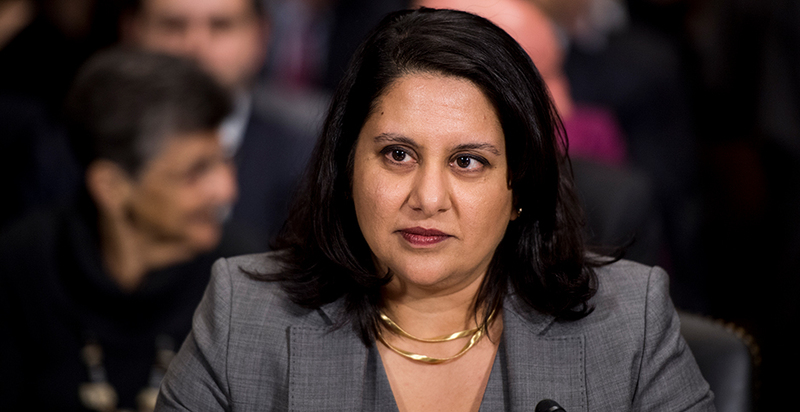 Neomi Rao will be sworn in this afternoon to the U.S. Court of Appeals for the District of Columbia Circuit, a forum with broad authority to review regulations and federal agency decisions, among other things. Rao is well-versed in the issues, having served as head of the White House Office of Information and Regulatory Affairs and as an administrative law professor before that. In those roles, she's been vocal in her skepticism of what many conservatives consider an unrelenting expansion of power for federal agencies. Environmental advocates are watching closely to see how Rao's background affects her disposition from the bench. They are concerned she will be quick to overturn certain anti-pollution rules or broad regulatory programs that come before the court. "We'll be waiting to see what kind of judge she is," Ben Driscoll, head of the judicial program at the League of Conservation Voters, said in a recent interview. "It's going to be an interesting and scary time to see." Case Western Reserve University law professor Jonathan Adler noted Rao's confirmation does not change the D.C. Circuit's balance; she'll take the seat vacated by Justice Brett Kavanaugh, who reviewed D.C. Circuit cases from a reliably conservative lens. Joseph Goffman, an Obama-era EPA official and executive director of Harvard Law School's Environment and Energy Law Program, pointed out that like her predecessor, Rao built her career among "extremely conservative members of the legal community centered around the Federalist Society." Another Kavanaugh-style judge on the powerful court is not good news for environmental litigants, Driscoll said. "In terms of political ideology, she's right there with him," he said. "I don't think we'll expect any better outcomes with her on the bench." A critical question, especially for the early years of Rao's tenure: Which cases will require her recusal? As head of OIRA since mid-2017, Rao's fingerprints are on nearly every major regulatory decision the Trump administration has made. Federal law requires circuit court judges to step aside from matters they worked on as government lawyers or advisers, and from cases where there could be a perception of bias. But judges have wide discretion when applying those standards, and it remains unclear where Rao will draw lines (Greenwire, Nov. 20, 2018). For example, should she recuse herself from litigation involving a regulatory mandate that predates her time at OIRA but that she promoted — as is the case for President Trump's "two-for-one" executive order, which requires agencies to toss two rules for every new one created? And should she step aside from cases involving a final EPA regulation if she was involved only in OIRA's consideration of an earlier proposal? During a confirmation hearing last month, Sen. Dianne Feinstein (D-Calif.) pushed Rao to commit to recusing herself from cases involving regulations she worked on at OIRA. Rao refused to make a firm commitment but said she would follow the relevant recusal standards. "This is of great concern as other nominees have understood the appearance of bias and unequivocally made such commitments," Feinstein said in a statement last week. Driscoll said he's hopeful Rao will "do the right thing." "For the near future," he said, "it's hard to imagine many cases where she doesn't have some conflict in considering the case." Rao's influence on environmental issues will be somewhat limited by her recusals and the random selection process for the three-judge panels that hear most D.C. Circuit cases. She'll join 10 other active judges and seven senior judges who often participate in the court's docket. During the course of her tenure, however, she is likely to hear scores of disputes with implications for environmental policy, including fights surrounding recent Trump administration moves. "It seems to me any sort of EPA rulemaking that's going to be finalized any time soon ... are going to end up before the D.C. Circuit," Goffman said. Those include reversals of Obama-era rules such as the Clean Power Plan and controls on vehicle emissions under the corporate average fuel economy standards. The D.C. Circuit could also field environmental lawsuits pushing the Trump administration to regulate certain sources of greenhouse gas emissions outside the electricity and car sectors, said UCLA environmental law professor Ann Carlson. Rao could also hear challenges to how EPA regulates coal ash disposal. The D.C. Circuit last year ordered EPA to strengthen its regulation for the coal-fired power plant residue. "So now the administration needs to issue a new rule that continues their deregulatory agenda, and conforms to the ruling by the D.C. Circuit, which will be interesting," said Caitlin McCoy, climate, clean air and energy fellow at Harvard's Environment and Energy Law Program. Advocates hope Rao would recuse in many of those cases, plus others that deal more directly with the regulatory process: EPA's "secret science" proposal to ditch research that lacks publicly available data from rulemaking; the agency's ongoing consideration of whether to include "co-benefits" when weighing the costs and benefits of new rules; and the Trump administration's "two-for-one" executive order prioritizing regulatory rollbacks. "That issue area is squarely within the purview of OIRA," said Center for Progressive Reform senior policy analyst James Goodwin. "They bring a unique expertise to that issue, so presumably they would have taken a very close look at that rule. She should really recuse." Other issues that could land on her docket: endangered species protections, offshore drilling, pipelines and environmental waivers for border wall construction. Two Federal Energy Regulatory Commission pipeline permits are at issue in cases pending before the D.C. Circuit: one for the Atlantic Coast gas project and one for the PennEast line. Either one could be crucial in the legal battle over pipeline development and climate change. Finally, Rao could influence a key administrative law debate simmering in federal courts regarding the Chevron standard directing judges to give deference to agencies interpreting ambiguous laws. Other recent Trump appointees, including Kavanaugh and Justice Neil Gorsuch, favor narrowing or striking down the precedent. "It's not as clear from her record what she would do," Driscoll said, "but the table has been set for the D.C. Circuit to set up a case for the Supreme Court to review."